What's In Store For The Election Loser? This story was written by Amie Parnes and Glenn Thrush. An Obama loss would shake American politics to its core, but the candidate said Wednesday that he'd adapt to life as a high-profile foot soldier in the Senate's Democratic majority. McCain hasn't said whether he'd return to the Senate if he loses his White House bid - and his campaign is bristling at the very suggestion. "McCain doesn't plan on returning to the Senate," McCain spokesman Tucker Bounds said Wednesday. "He plans on winning the election because he's absolutely qualified to be president of the United States." But friends and GOP insiders who've taken a sober look at the polls expect to see McCain back at the Capitol come January - and maybe even as early as a lame-duck session scheduled to start two weeks after the election. They're just not sure what role he will play there. "I think John will return to the Senate," says a longtime friend of McCain's. "The question is whether he'll return to be a constructive force or whether he'll be embittered. Only John can answer that." Operatives in both parties say that Obama's defeat would have a tectonic impact outside of Washington - setting off a massive wave of angry soul-searching among Democrats who turned self-flagellation into an art form after a pair of losses to George W. Bush. Yet Obama's return wouldn't greatly change the political order of the Senate. Still a freshman, the junior senator from Illinois would join Senators Hillary Rodham Clinton (D-N.Y.) and John F. Kerry (D- Mass.) in the We-Were-Almost-President Caucus, and he'd still have to abide by the dictates set by a stable Democratic leadership which seems certain to pick up seats regardless of Obama's fate. Asked about a possible return, Obama told ABC's Charles Gibson Wednesday: "I'm a relatively young man. You know, they say there's no second acts in politics. But you know, I think there are enough exceptions out there that I think I could envision returning to the Senate and just doing some terrific work with the next president and the next Congress." "McCain is going to return to a shattered party," said Republican strategist John Feehery, who was a senior aide to former House Speaker Dennis Hastert (R-Ill.). "But he'll still be the biggest name in the Senate and the biggest name in Republican politics, and I think some people will rely on him to be the voice during these times… It'll be up to him on whether he gives up or helps re-brand the party." "The problem is way bigger than John McCain," said a top Republican staffer who has worked in both houses. "We don't have any ideas, and we need ideas to connect" with independents. But just because McCain has pushed a "maverick" reform agenda as a presidential candidate doesn't mean his GOP colleagues in the Senate will let him do the same for them. Senior Republican aides say McCain's willingness to challenge party leaders on immigration and earmarks has made him unpopular - and that losing the presidential election wouldn't do much to burnish his reputation. "Like John Kerry, who came back and went underground, McCain will likely return to Washington to find that he's not the leader of his party," said one top GOP Senate aide. Thomas Mann, a congressional scholar with the Brookings Institution, remembers the bitter McCain who returned to the Senate in 2000 after losing to Bush in the Republican primaries. "He was basically alienated from the Republican Party" Mann says. "For a long while, he opposed the central pillars of the Bush administration, like on tax cuts for example and he really flirted with the Democrats. This time, he'll find there are no friends on either side of the aisle." Another senior GOP staffer predicted Senate Republicans, reeling from big losses on election day, might eschew McCain and other leaders like Minority Leader Mitch McConnell (R-Ky.) - assuming, of course, that McConnell survives his own tough reelection fight. "People will be ready for a new generation to step forward not only in the Senate but in the House, too," the aide said, dismissing McCain as "an elder statesman" type. While Obama is unlikely to face animosity from fellow Democrats if he returns to the Senate - he didn't start with a base of negative feelings, and there have been few complaints about the campaign he's run. Getting other Democrats to share his nonchalance about returning to Washington? Not so easy. "If Obama returns to the Senate, he will be coming with some combination of Scotland Yard, the FBI and Chicago PD to investigate how the election was stolen," joked Democratic strategist Chris Lehane, a former Kerry campaign aide. After law enforcement leaves the building, Obama would have to muster his huge national base of support to oppose McCain policies he abhors, Lehane said. "With the numbers Democrats are likely to achieve in the Senate and House, [Obama] could create an effective shadow government along the UK parliamentary style version - but one that actually passes legislation," he added. 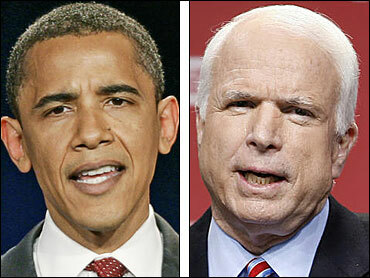 Republicans aren't sure McCain would play a similar role if Obama is elected. "[Senate Republicans] won't look to him to lead," said GOP strategist Ron Bonjean. "Any candidate who loses is not expected to pick up the mantle and lead the party because they lost. ... Republicans will look to other leaders to continue the fight. Anytime you lose it's difficult to make a comeback as the leader of the party. He'll be a well respected voice." Complicating matters is the fact that the former Navy flier is up for reelection n 2010 - and will be 74 if and when he's sworn in for a fifth term. "Is he going to stay?" asked an aide to top House Republican. "Because if he's not running again, forget about it. He won't play any serious role." "He would take a high profile role on those issues," adds Bonjean, a former aide to Arizona's junior Republican senator, Jon Kyl. "I think he returns as John McCain the maverick. ... He'll go issue by issue, but he's not going to take a front seat role in driving the party's message," he says. "I think Sen. McCain will continue to play the adversarial maverick role that he enjoys and probably a little more so and probably more than anyone would like." If McCain enjoys being a maverick in his own party, he's likely to relish it even more in fighting against key parts of Obama's agenda - especially on Iraq and foreign policy. "I don't think he has a lot of respect for Obama," said Feehery. "There's not a lot of love there, and I don't see Obama going to him for his seal of approval, anyway." "I could definitely see him cooperating with Obama," says McCain's friend, "if the Obama people are smart enough to be respectful and accommodating."